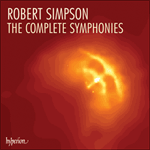 Simpson's Symphony No 2, completed in 1956, remains the most frequently played of all the composer's orchestral works. It is dedicated to Anthony Bernard, the conductor of the London Chamber Orchestra, and his wife Mary. Like two of Simpson's later Symphonies, No 7 (1977) and No 11 (1990), the Second is scored for a standard classical orchestra — the same forces, in fact, that Beethoven chose for his first two symphonies: double wood wind, pairs of horns and trumpets, timpani and strings. The composer has stipulated that high D trumpets must be used rather than the more customary B flat instruments. Like the First Symphony (1951), No 2 is in three movements, adopting a fast-slow-fast pattern, though here the movements are played separately. 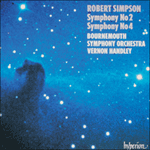 As with Simpson's first three string quartets which immediately preceded it, the Second Symphony shows a profoundly original treatment of 'progressive' or 'emergent' tonality whereby the music is driven forward by two or more conflicting keys. Here the tonal centre is B with a strong pull towards the two keys a major third above and below, E flat and G.
The 'Allegro grazioso' begins and ends in B, with two big climaxes in E flat and G respectively. It adopts a gently swinging, fast triple-time pulse that suggests a faint reminiscence of Nielsen, one of Simpson's lifelong idols. The movement begins quietly, but with a great sense of latent energy as the music naturally evolves from the initial motif heard at the outset on violins and violas. Placed on either side of the two climaxes are two fugatos: the first for strings alone is strong, determined, whereas the second, begun by the woodwind, skips along with much mischief and jollity. After the second climax has subsided, the opening theme returns at a slower tempo, gradually fading away into silence as the first bar of the Symphony is repeated several times. The slow movement is placed second and is cast as a theme with thirteen variations on a gravely beautiful unharmonised viola melody which revolves gently from E flat to G. In fact, with the exception of the last five bars, the movement is strictly palindromic, so that the oscillation between keys is reversed half way through. The middle variations, which are all pianissimo, seem to provide a 'still centre' to the whole Symphony and perhaps evoke the immensities of a nocturnal, star-lit sky. The Finale returns to the original key of B. It is a strong, stamping movement with a tigerish energy and rhythmic drive similar in spirit to the last movement of Beethoven's Seventh Symphony which is acknowledged as an important influence. As with the Beethoven, it is astonishing to hear how Simpson can make this Finale roar whilst still employing an orchestra of relatively modest proportions. The overall structure mirrors that of the opening Allegro, with the first climax in E flat and the recapitulation grafted on to the second climax in G. An extended coda is needed to restore the key of B with the greatest force. When this is achieved the movement ends abruptly with considerable vigour.